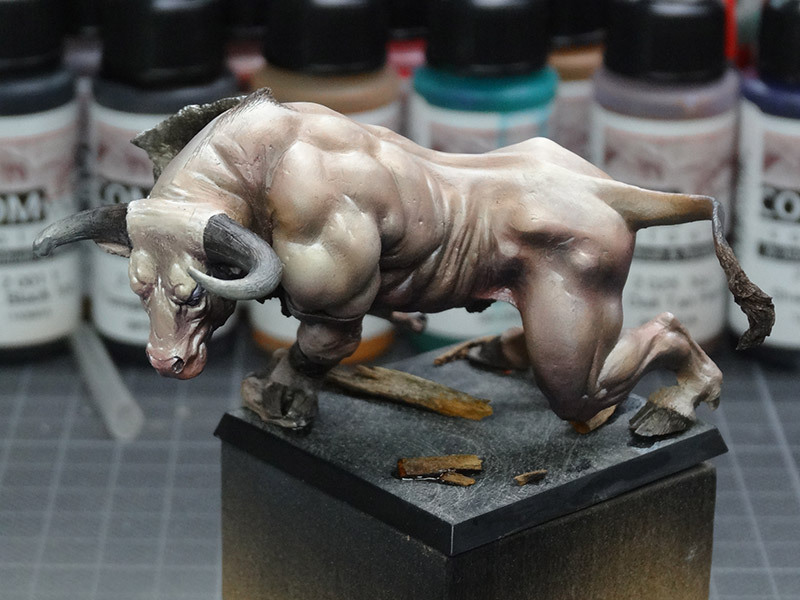 I recently saw a impressive step by step by Chris Clayton on his blog and so I just had to try out some new approaches and the airbrush colors that Chris used. 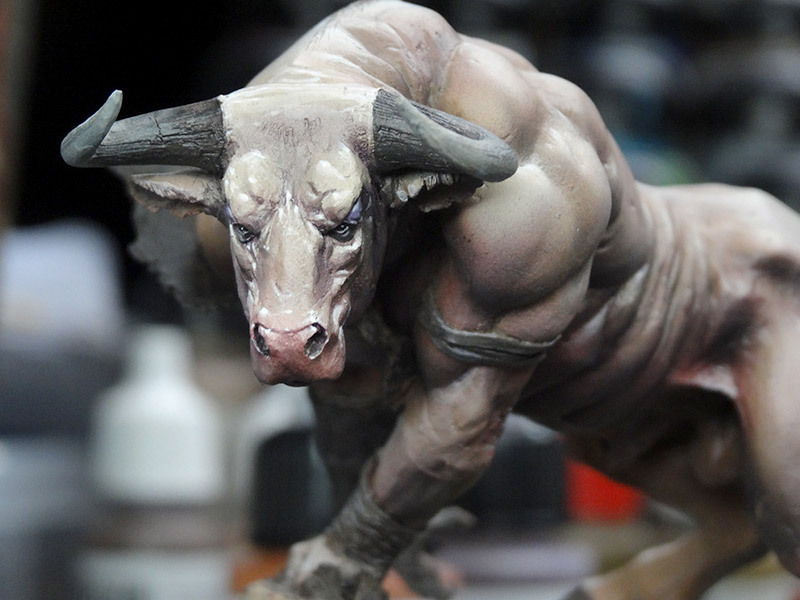 The model painted in this article is the Werebull by Spherewars, you can find another impressive version of this model here, painted by Roman. 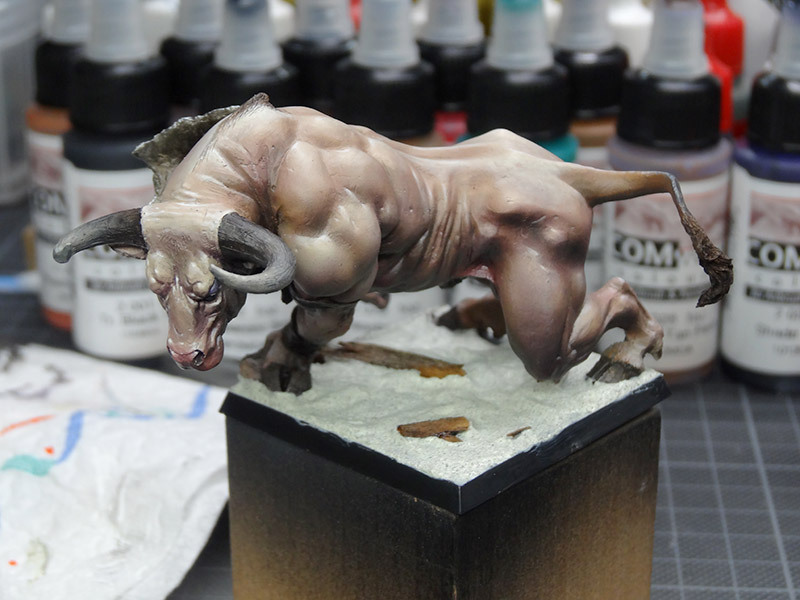 Next step is to prime grey with the airbrush. I primed from all sides, not just above, to get a even grey coat. 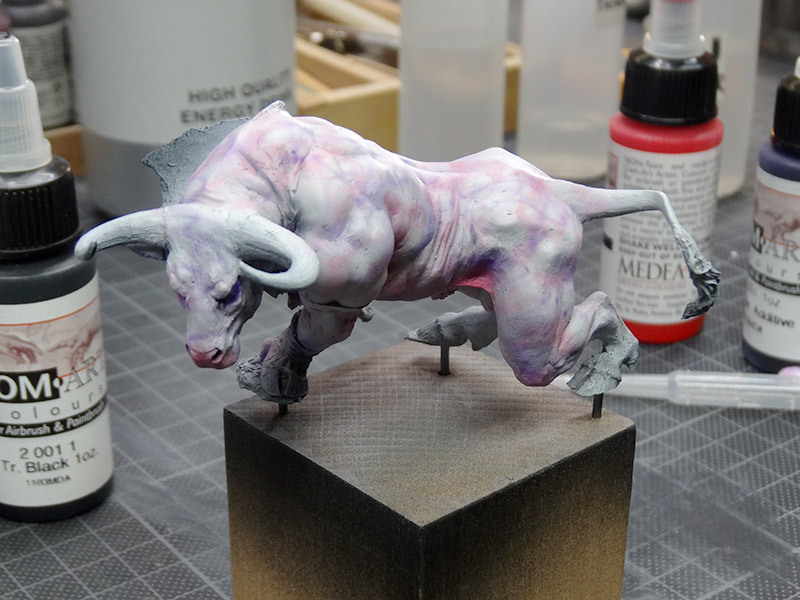 For this paintjob I wanted to try out a line of airbrush colors that I did not try before. The brand is called "Com-Art". 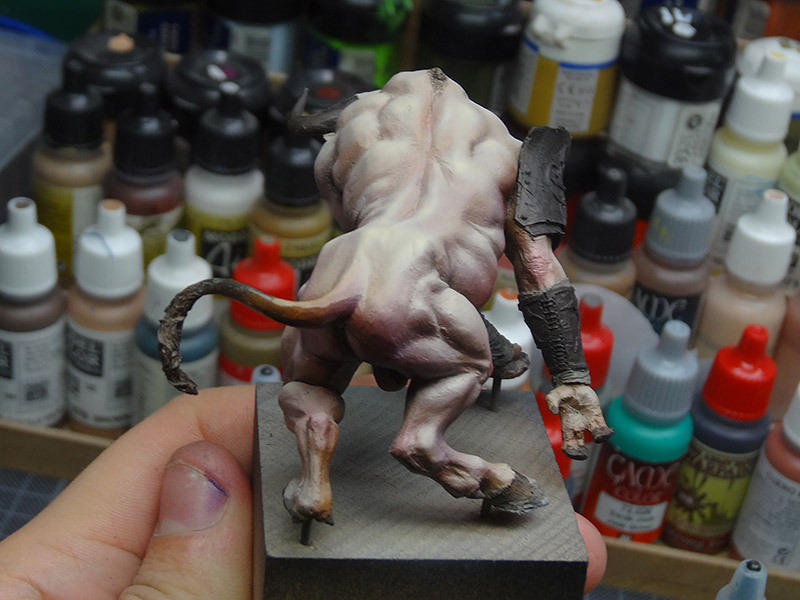 I started with red and airbrushed areas that receive more "bruising". 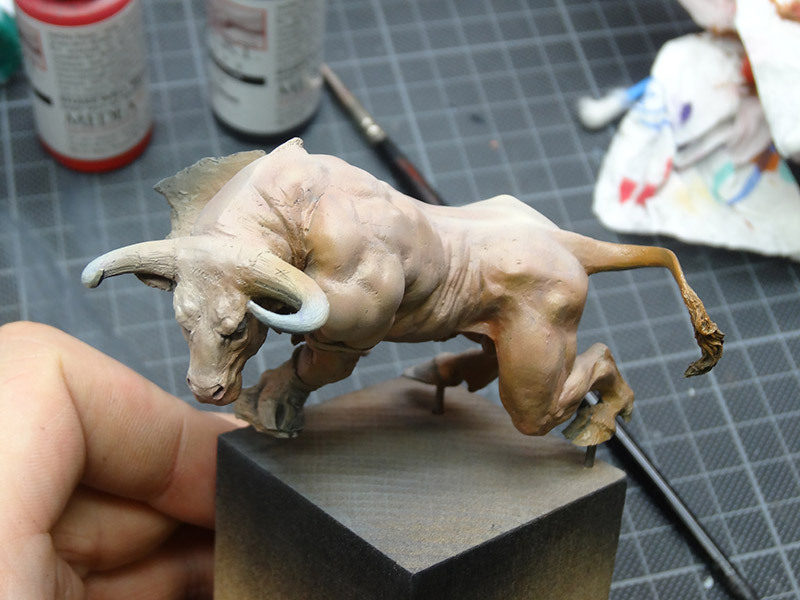 I also sprayed a pattern on the whole bull, nothing to fancy, just some jiggly lines. The next step was to do the same with violet. 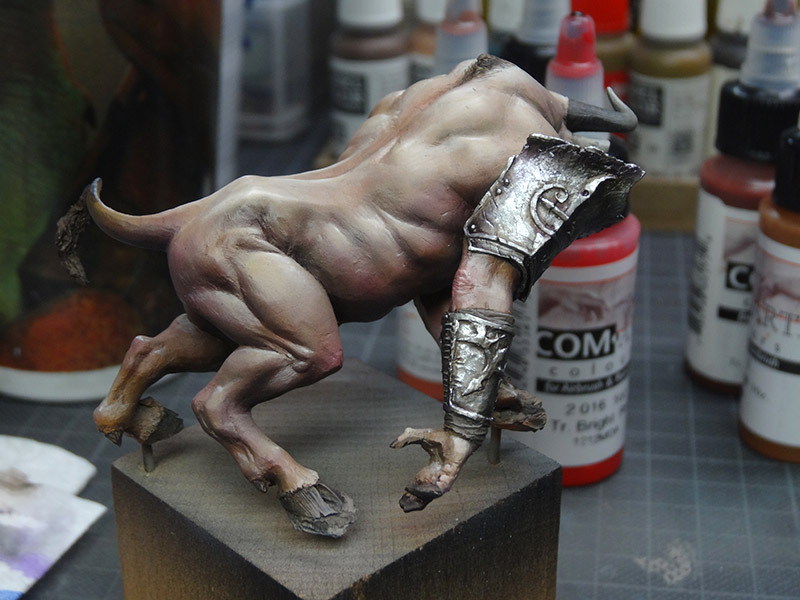 To bring all of this crazyness together, I sprayed it with one of the skin tones. 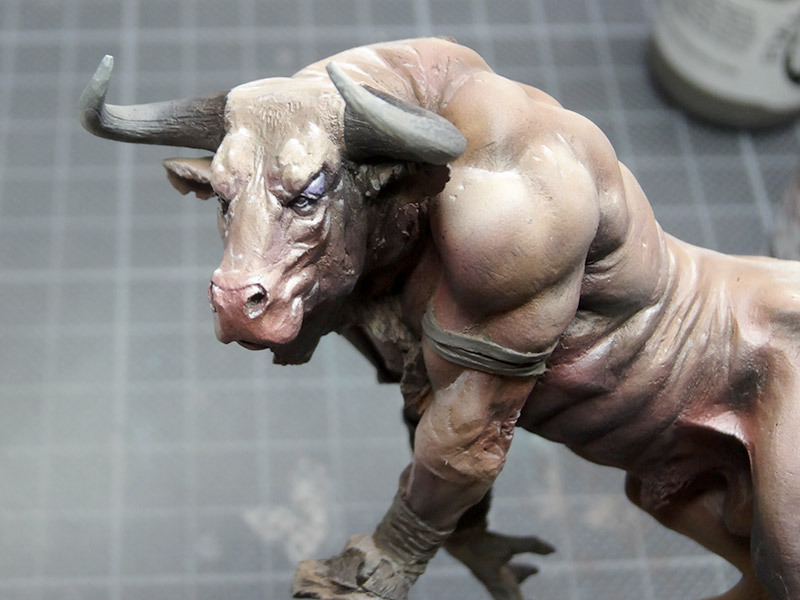 I tried to cover the whole bull with this color. Another layer of a different skin color and the pattern fade more and more. Just a small glimpse is still visible of the red and violet color pattern. I mixed the Com-Art transparent white (which is a really good airbrush white!) 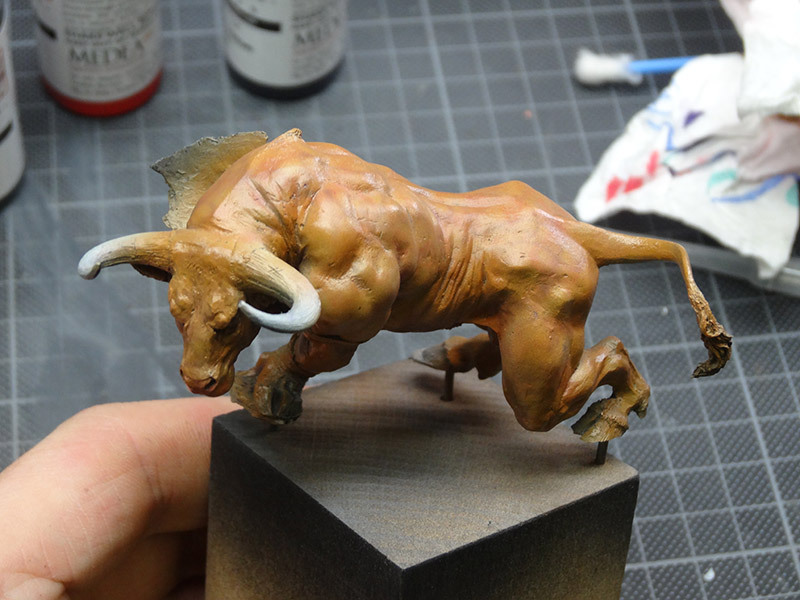 with a little bit of a skintone and started airbrushing strong lights. I tried to concentrate on the places where I wanted to have light areas later. This is the result of this step. Now, using some red, I brought back the colorful areas of the skin. 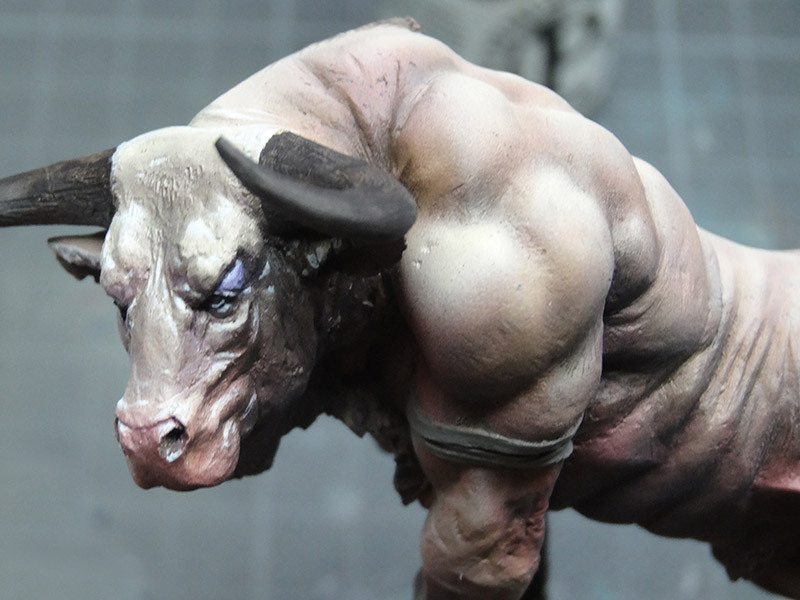 All of the areas where I wanted to put some interesting color play in the skin were airbrushed with red and violet very gently. 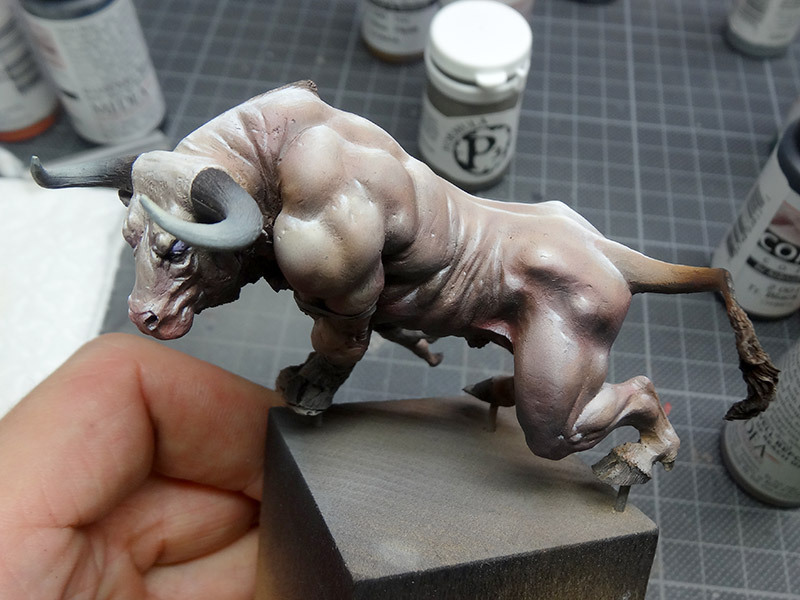 Now I started to airbrush some shadows. I used mostly Com-Art transparent smoke. 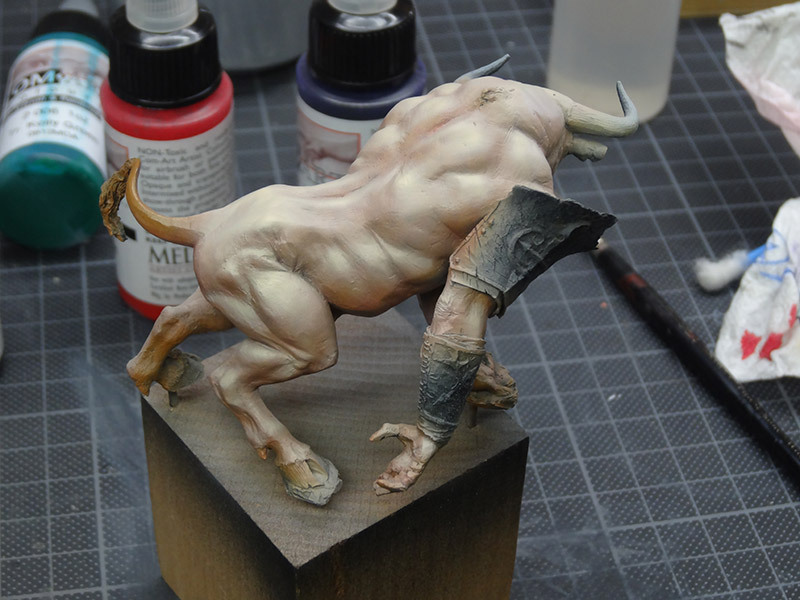 I also used a mix of black and a little bit of dark brown to paint the horns, tail, feet and metal parts. a dark, warm grey was used for the bands on the feet. 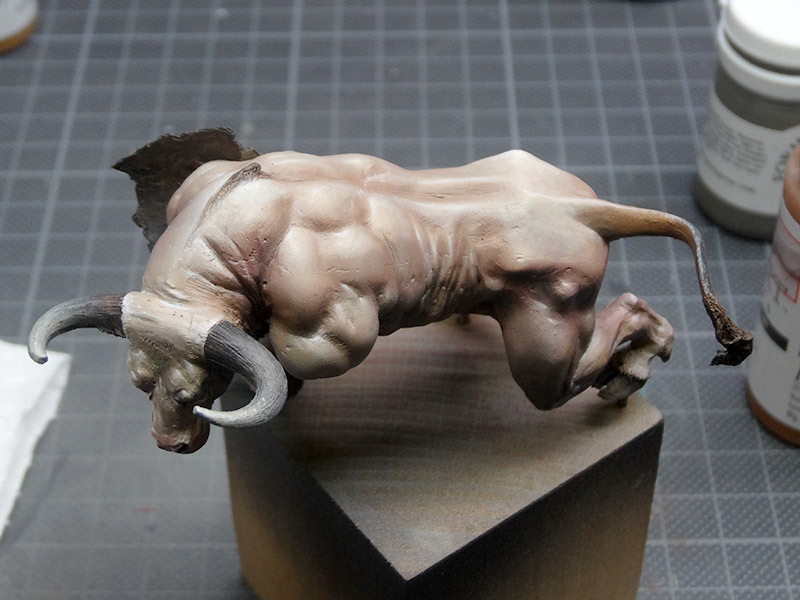 For now, the airbrushing part was finished and I started working with a brush to bring in some details in the face and body. 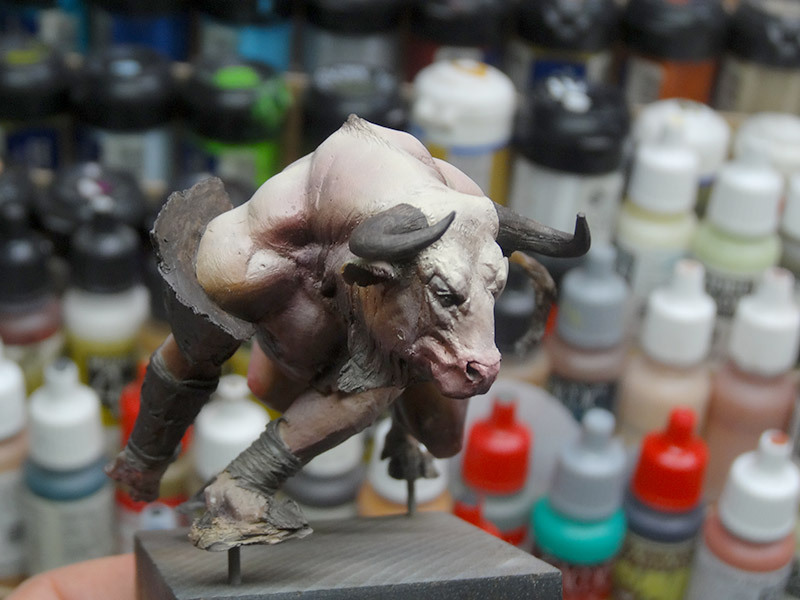 I started with the face, painting shadows with a mix of transparent smoke and black, and painting lights with Com-Art transparent white + a skin tone to create a nice off-white. All the steps from here were done with the glazing technique. 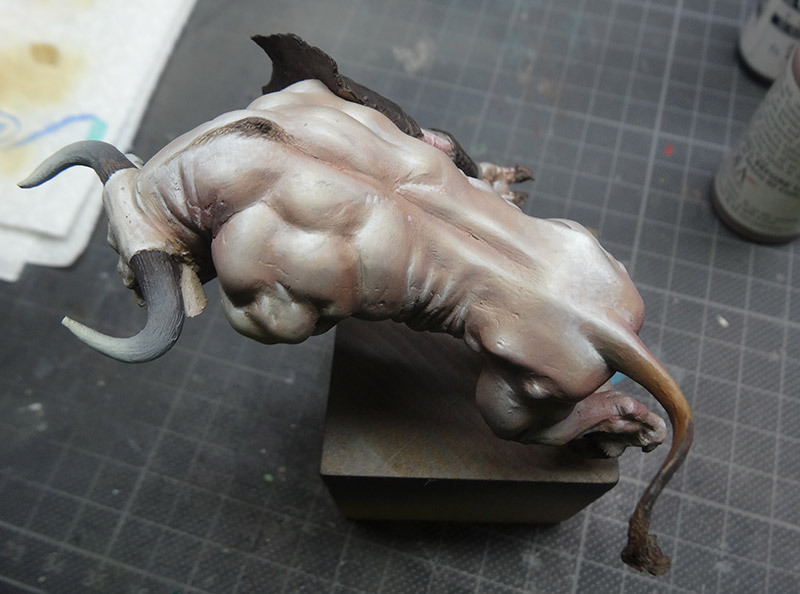 I also redefined the lights on the body with the same highlight color. 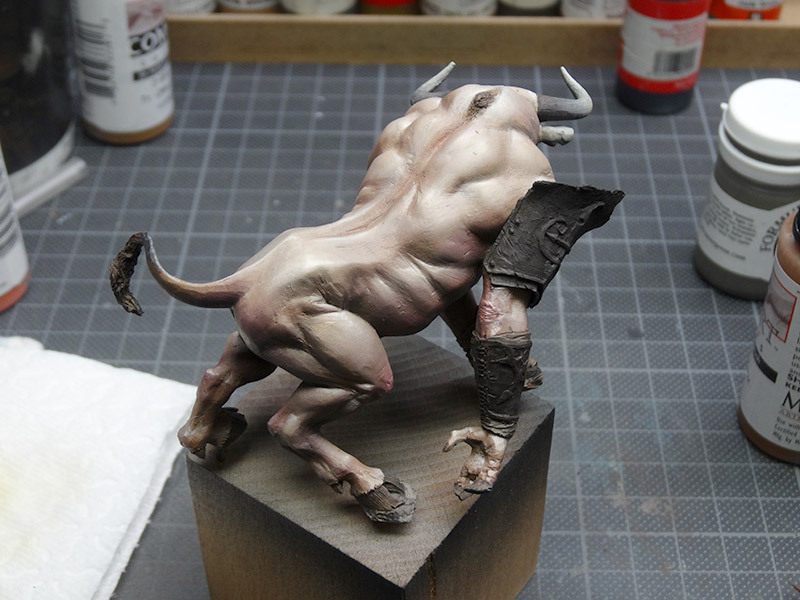 Some more angles of the work I did so far. Ok, now I start with the shadows. Using transparent smoke I started working on the facial details. 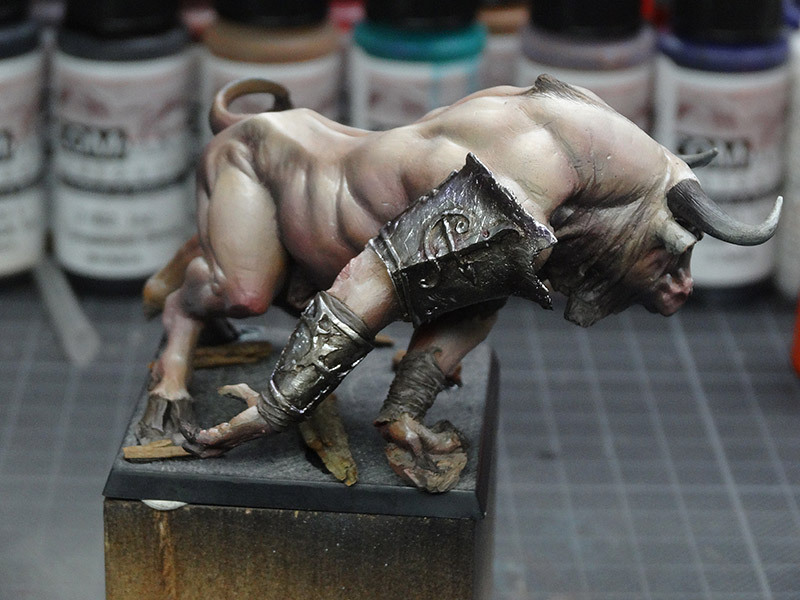 I also started working on some smaller shadows on the back and on the side. The almost finished face. 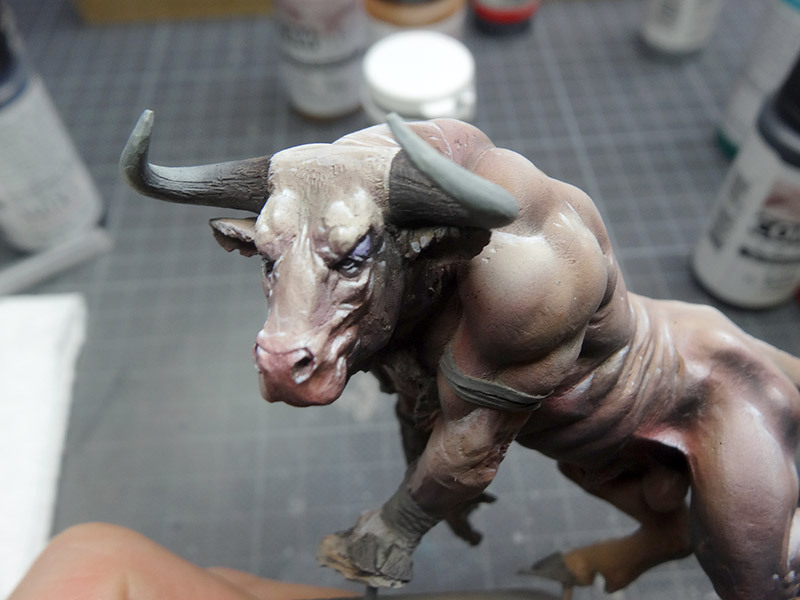 The eyes were painted very simplistic, just black with a small white highlight spot. 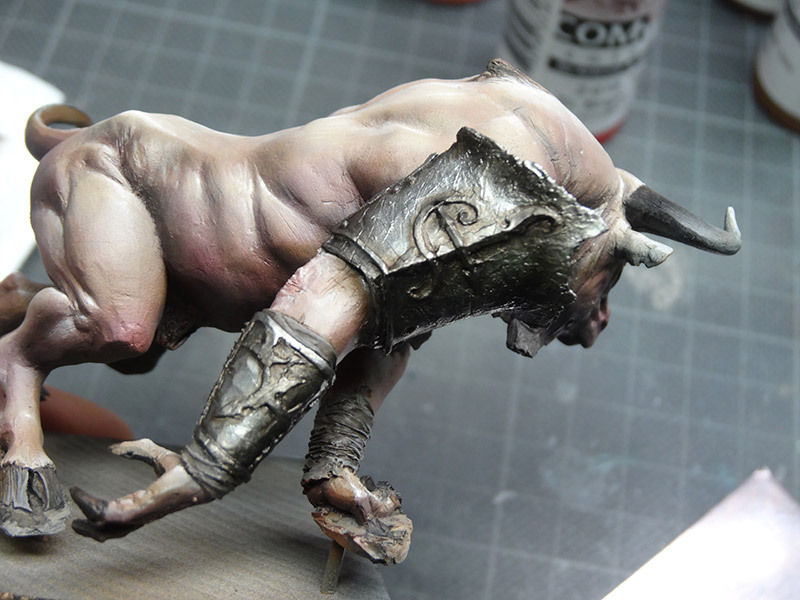 Using Chainmail Silver and a little bit of Golden Acrylic Fluid Carbon Black I gave the metal parts a quick basecoat. 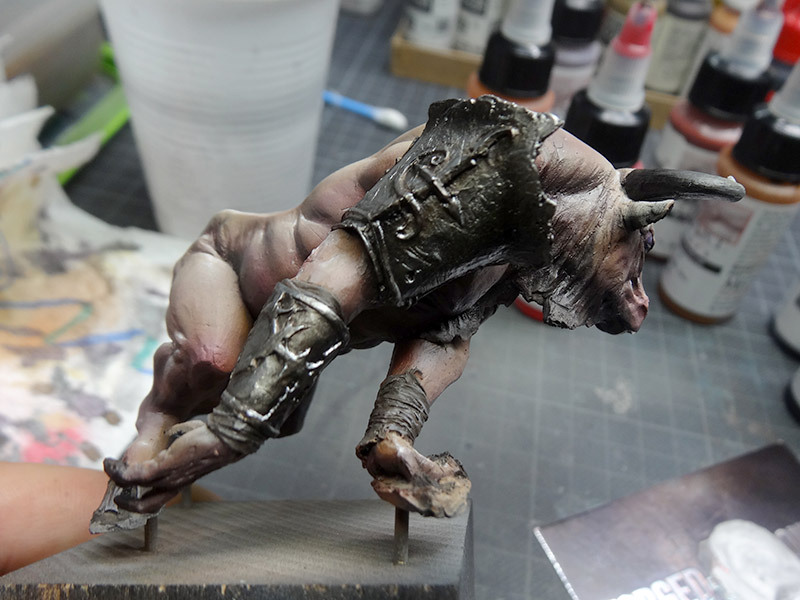 Using Army Painters Quickshade QS Strong Tone Ink I gave the metal a quick wash. I tried to avoid painting large, even surfaces with the ink. 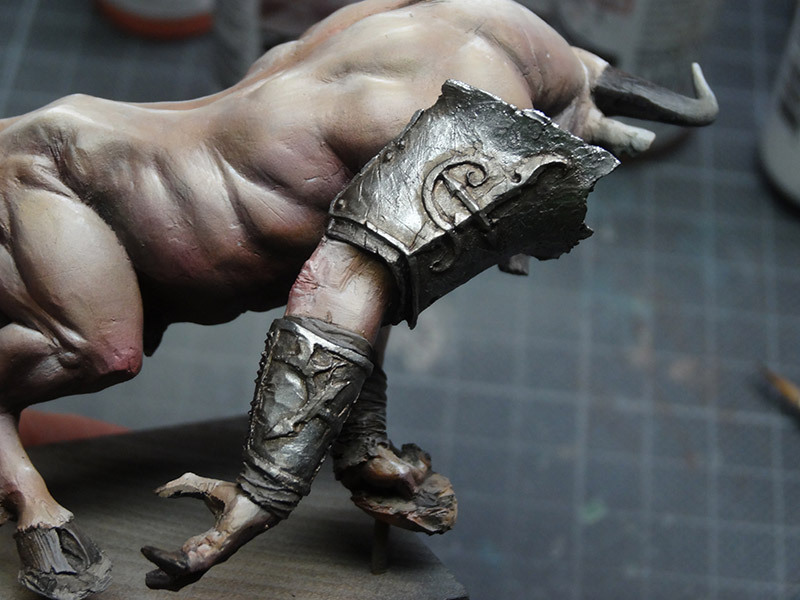 This step gives the metal parts some definition and a old look. 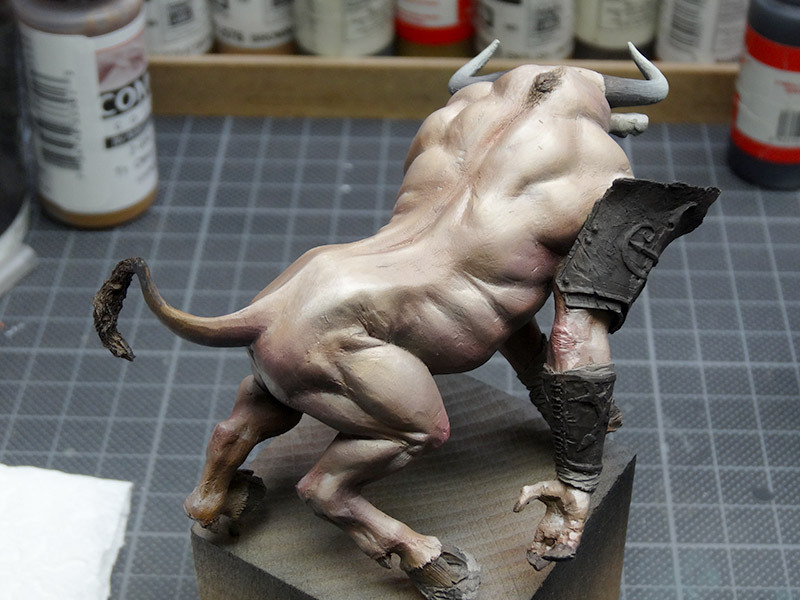 Next step was airbrushing the shadows. I used transparent smoke again to bring in some darker areas. 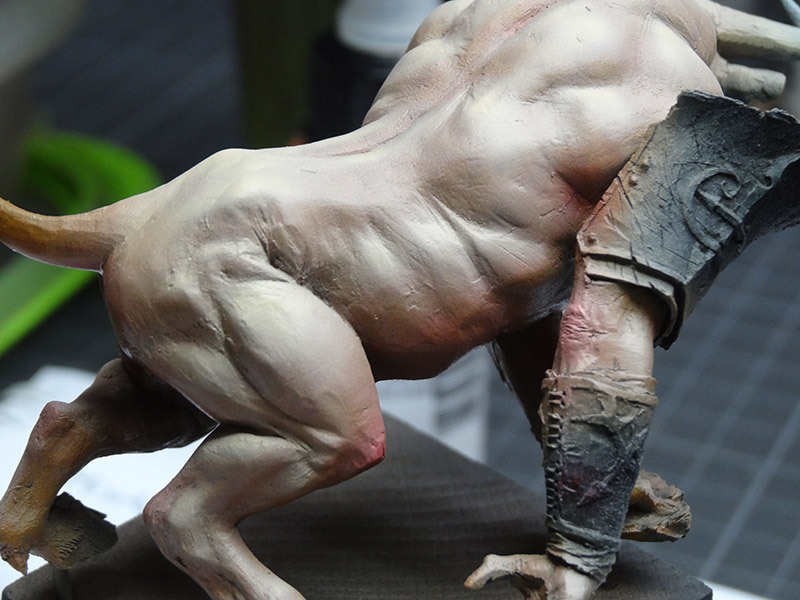 Using the brush, some more shadow details were brought in. 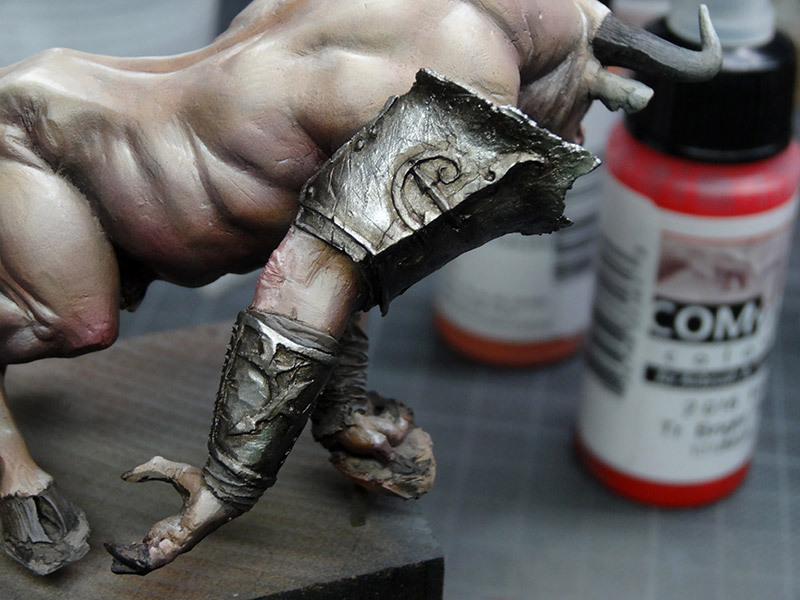 First lights were painted using pure chainmail silver. Some lights were also painted in the shadow areas using chainmail again. 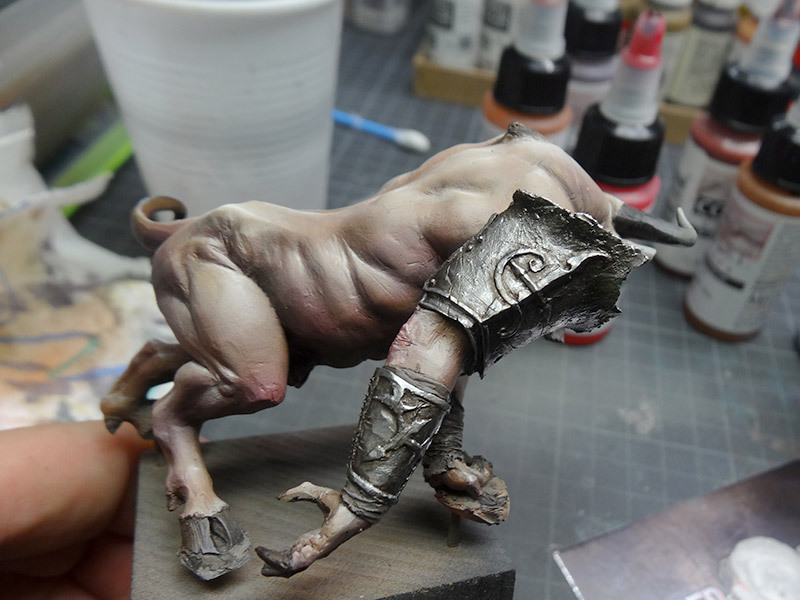 Just to bring out some details and to avoid a boring area on the metal. 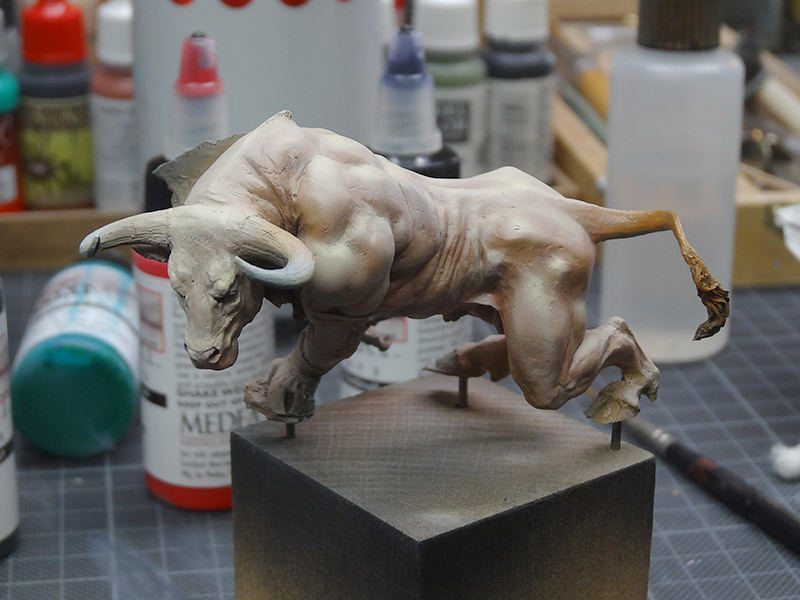 Last highlights were painted with Iridescent Pearl from Golden Acrylics. 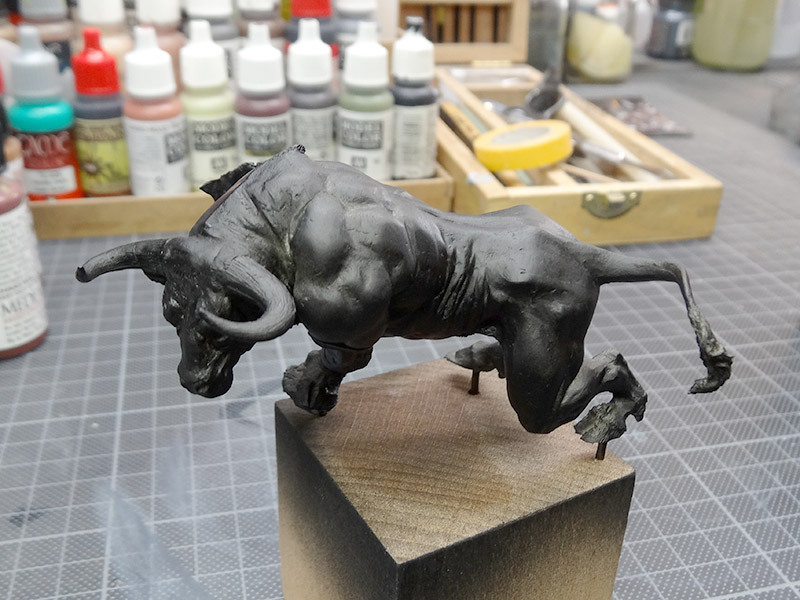 I stippled on some highlights onto the large surfaces. Just to make it more interesting. One of the last steps is to increase contrast on all lights. 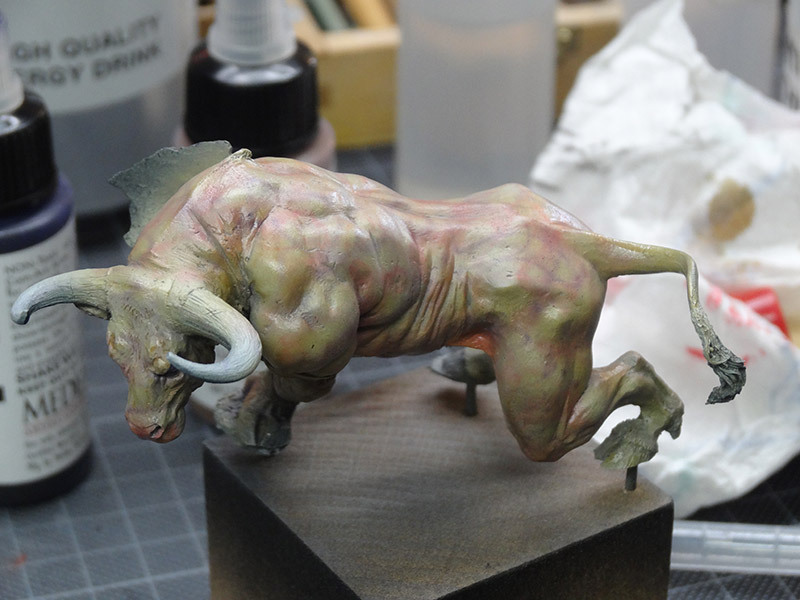 Before, the brightest color I used was not pure white, but some kind of brownish off-white. 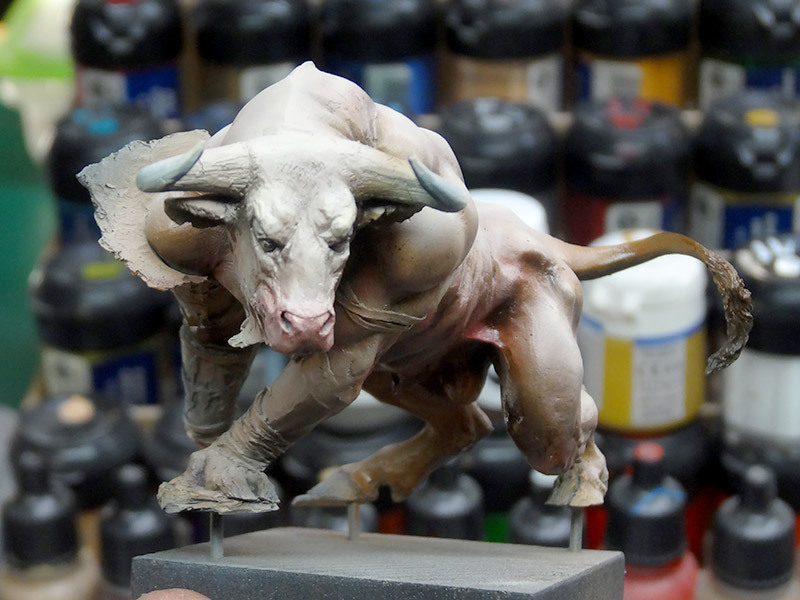 Now I will use pure white to give the paintjob the last intense step. 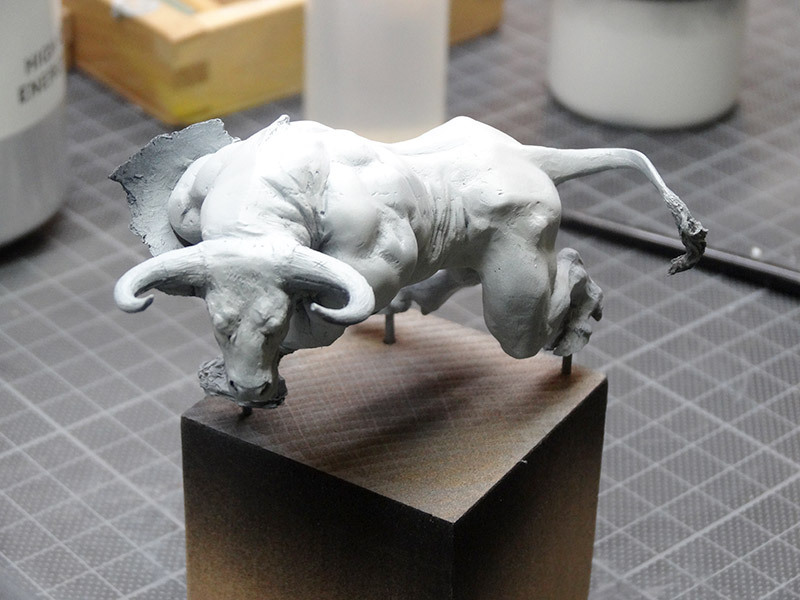 I also put him on a gaming base and glued some pieces of wood onto the base. 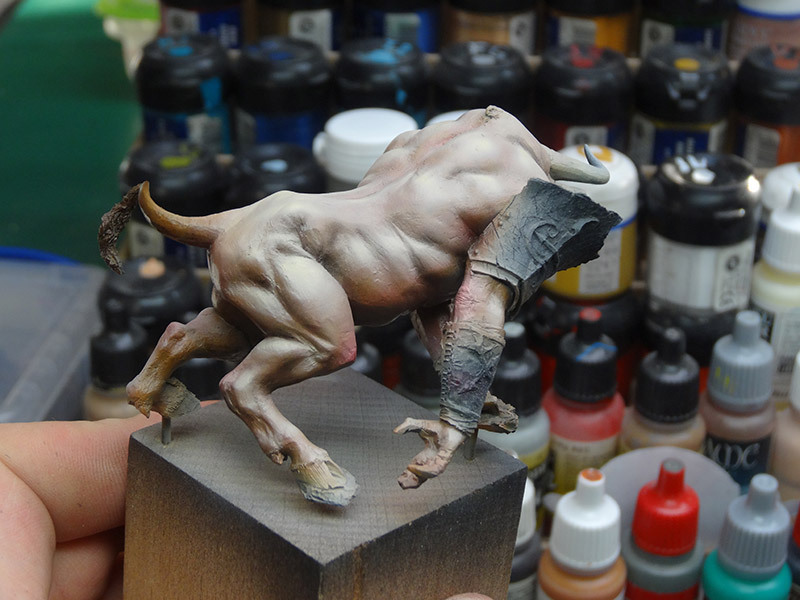 I started with some sandy Vallejo putty which will give me a base for further detailing. - Com-Art Airbrush colors are pretty nice, especially the transparent white sprays excellent and the transparent smoke gives a very nice dark tone. 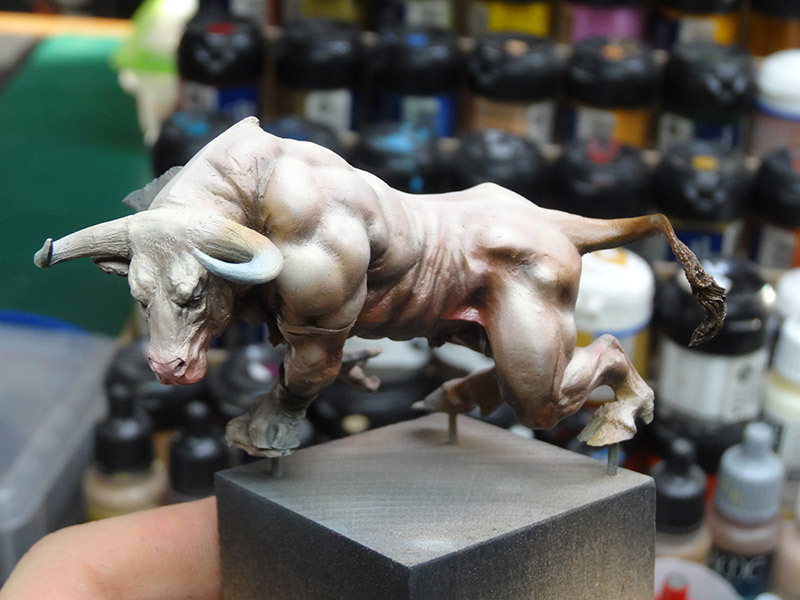 - Try to avoid painting hightlights with pure white from the start, choose some off-white color to give yourself some room to play with final white highlights in the end. 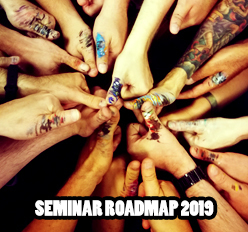 - To make skin color more interesting, try to introduce many different color tones: violet, red, green, blue... everything goes as long as it is applied VERY gently. "Picster (at) MassiveVoodoo (dot) com"
Very good. I am often too scared to push my highlights all the way to pure white. I need to man up, because it looks great with all that contrast. There is so little white but it adds so much! How much if any of the 'bruising' stage comes through in the final prices. It's difficult to see anything on my phone, but I was wondering if in hindsight you would have gone darker with these bruises? Ahhh... nice result :) thx for the step by step! 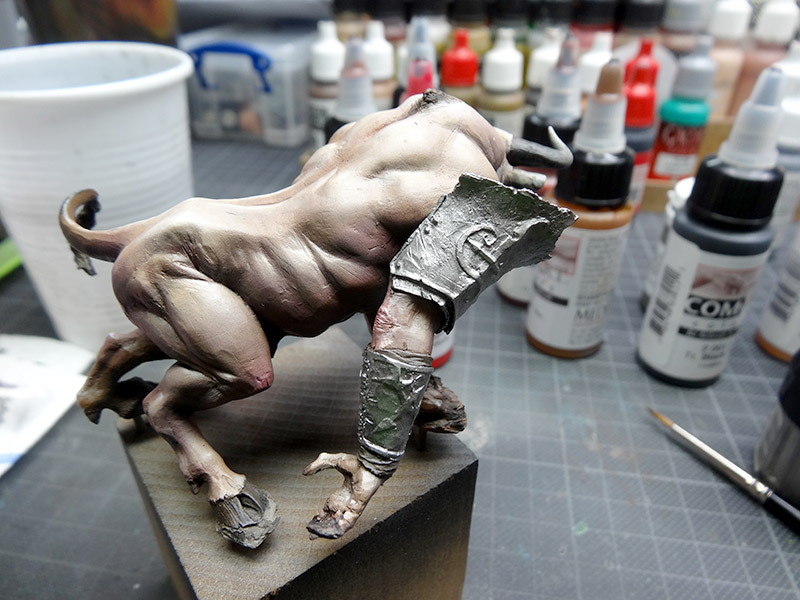 Great step-by-step, love the result. Thanx for sharing! looking good...where did you get the colors from? @Kristian: Thanks for the comment, glad if it is useful! thank for the great step by step tutorial. 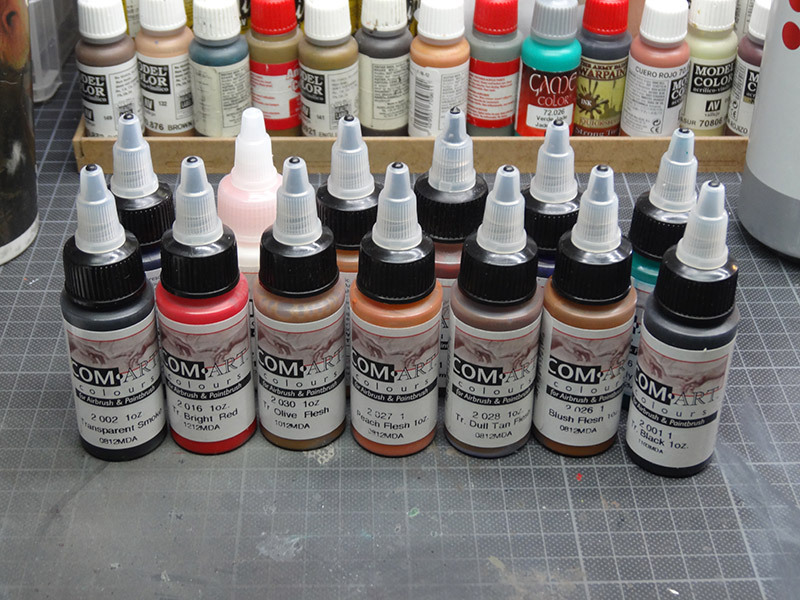 I have two questions: It seems that the COM-Art colors are a littel bit glossy? In the webshop I only find a opaque white, you wrote that you use a transparent one. What is right? I would be happy about an answer. Yes, they are a bit glossy, but nothing that can't be solved with a little bit of matt varnish. And I just checked, it was opaque white. 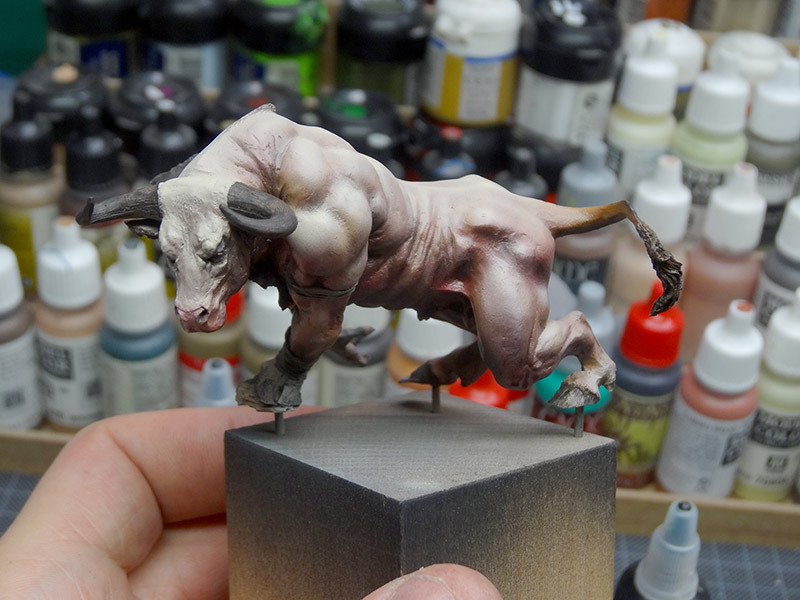 What airbrush do you guys use?